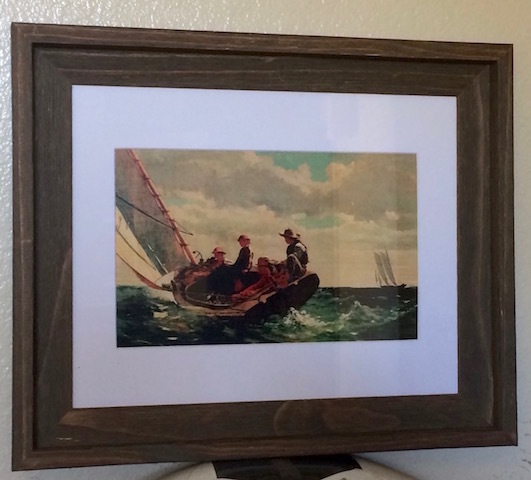 There is a Winslow Homer painting that I really love. Homer called it, "Breezing Up". Somehow, I got it into my head that I wanted make my own Breezing Up with a Paint By Numbers kit. In order to prepare myself to do this Homer painting, I bought a paint by numbers kit from Faber-Castell of Monet's "The Japanese Footbridge" [link]. The Monet kit that I bought was rated for people over 8 years. Wow! I found out quickly that apparently I did not have the skill level of an 8 year old! That's when it came to me that I could do this project with a digital image! All that I was really after, was to hang Homer's "Breezing Up" on my apartment's wall. After capturing this image on the net, I used Apple's "Photos" [link] to adjust the image to my liking. There is a copy store just a few blocks away from Guava, where I bought a nice reproduction on photo paper. Very nice George! When you say "photo" what particular program do you mean? I have the editing program that comes with my iPhone 6s. Is that it? Thanks. It's actually, Apple's "Photos" program. I just edited my blog to make that clear. Always been one of my favorites, too. It's the essense of sailing to me. I wanna see what you painted!!!! So far, I only bought a Paint By Numbers, Monet's "The Japanese Footbridge". I have not even begun to paint!! Because of the digital age that we have right now, printing is really a luxury since everything and everyone can be tag on different social media. That's why my colleagues from http://www.trustessays.com/research-paper see to ito have a printed photo of their adventures to serve as beautiful memories.